Rigoberta Menchu Tum is a Guatemalan activist for native rights and winner of the 1992 Nobel Peace Prize. She rose to fame in 1982 when she was the subject of a ghost-written autobiography, "I, Rigoberta Menchu." At the time, she was an activist living in France because Guatemala was very dangerous for outspoken critics of the government. The book propelled her to international fame in spite of later allegations that much of it was exaggerated, inaccurate or even fabricated. She has kept a high profile, continuing to work for native rights around the globe. Menchu was born Jan. 9, 1959, in Chimel, a small town in the north-central Guatemalan province of Quiche. The region is home to the Quiche people, who have lived there since before the Spanish conquest and still maintain their culture and language. At the time, rural peasants like the Menchu family were at the mercy of ruthless landowners. Many Quiche families were forced to migrate to the coast for several months every year to cut sugarcane for extra money. Because the Menchu family was active in the land reform movement and grass-roots activities, the government suspected them of being subversives. At the time, suspicion and fear were rampant. The civil war, which had simmered since the 1950s, was in full swing in the late 1970s and early 1980s, and atrocities such as the razing of entire villages were commonplace. After her father was arrested and tortured, most of the family, including 20-year-old Menchu, joined the rebels, the CUC, or Committee of the Peasant Union. The civil war would decimate her family. Her brother was captured and killed, Menchu said she was forced to watch as he was burned alive in a village square. Her father was a leader of a small band of rebels who captured the Spanish Embassy in protest of government policies. Security forces were sent in, and most of the rebels, including Menchu's father, were killed. Her mother was likewise arrested, raped and killed. By 1981 Menchu was a marked woman. She fled Guatemala for Mexico, and from there to France. It was in France in 1982 that Menchu met Elizabeth Burgos-Debray, a Venezuelan-French anthropologist, and activist. Burgos-Debray persuaded Menchu to tell her compelling story and made a series of taped interviews. These interviews became the basis for "I, Rigoberta Menchu," which alternates pastoral scenes of Quiche culture with harrowing accounts of war and death in modern Guatemala. The book was immediately translated into several languages and was a huge success, with people around the world transfixed and moved by Menchu's story. Menchu used her newfound fame to good effect -- she became an international figure in the field of native rights and organized protests, conferences, and speeches around the world. It was this work as much as the book that earned her the 1992 Nobel Peace Prize, and it is no accident that the prize was awarded on the 500th anniversary of Columbus’ famous voyage. 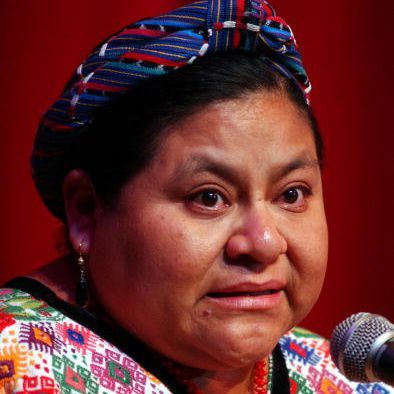 In 1999, anthropologist David Stoll published "Rigoberta Menchu and the Story of All Poor Guatemalans," in which he pokes several holes in Menchu’s autobiography. For example, he reported extensive interviews in which local townsfolk said that the emotional scene in which Menchu was forced to watch her brother burned to death was inaccurate on two key points. First of all, Stoll wrote, Menchu was elsewhere and could not have been a witness, and second, he said, no rebels were ever burned to death in that particular town. It is not disputed, however, that her brother was executed for being a suspected rebel. The reactions to Stoll’s book were immediate and intense. Figures on the left accused him of doing a right-wing hatchet job on Menchu, while conservatives clamored for the Nobel Foundation to revoke her award. Stoll himself pointed out that even if the details were incorrect or exaggerated, the human rights abuses by the Guatemalan government were very real, and the executions happened whether Menchu actually witnessed them or not. As for Menchu herself, she initially denied that she had fabricated anything, but she later acknowledged that she might have exaggerated certain aspects of her life story. There is no question that Menchu’s credibility took a serious hit because of Stoll’s book and a subsequent investigation by The New York Times that turned up even more inaccuracies. Nevertheless, she has remained active in native rights movements and is a hero to millions of impoverished Guatemalans and oppressed natives all over the world. She continues to make the news. In September 2007, Menchu was a presidential candidate in her native Guatemala, running with the support of the Encounter for Guatemala Party. She won only about 3 percent of the vote (sixth place out of 14 candidates) in the first round of elections, so she failed to qualify for the run-off, which was eventually won by Alvaro Colom.